The beautiful center of Aix-en-Provence, both historic and a focus of life today. 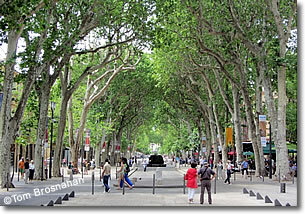 The Cours Mirabeau is the main street of Aix-en-Provence. Wide and shaded with graceful plane trees, it is a lovely place to stroll. It is bounded at one end by the Place de la Rotonde, with its large and beautiful Fontaine de la Rotonde. 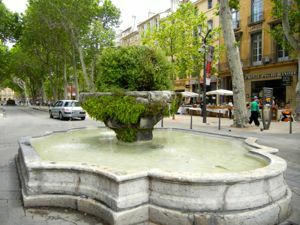 This lovely fountain is today a symbol of Aix-en-Provence. Its bronze lions pose majestically around the fountain, and the three graces stand atop it. The Cours Mirabeau was built in 1649, on the site of the city walls. Then as now, it was a place to see and be seen. It was originally lined with elm trees, which were replaced by plane trees in the 1830s. The shops and restaurants which are so prevalent today also appeared in the 19th century. The area was renovated and restored in the late 20th century, making it even more accessible to visitors. As you walk down the Cours Mirabeau you will see several lovely fountains. The Fontaine des Neuf Canons does not refer to canons, but rather to the nine (neuf) water pipes/jets that fill this fountain, which was built in the 17th century as a watering place for sheep. Be sure to also admire the many hôtels particuliers, or private mansions, that line the street. From the 17th century on, this was where the leading families of the nobility wanted to build their elegant homes and demonstrate their success. Their ornate decorations create a beautiful urban scene. The Cours Mirabeau is a great place to begin your visit of Aix-en-Provence, and the Tourist Information Office is just the other side of the fountain. From here you can easily explore the old city, walk to St-Sauveur, visit some museums, or even walk up to Paul Cézanne's studio. If you're hungry or thirsty, you'll find plenty of places for a snack or a meal, and the many shops can also keep you busy for a while. Below, Fontaine des Neuf Canons, with shops and restaurants in the background.